There’s rip’n’flip, as exemplified by the Lenovo Helix, and arguably by the Surface Pro 3 (which its own twist, the kickstand). 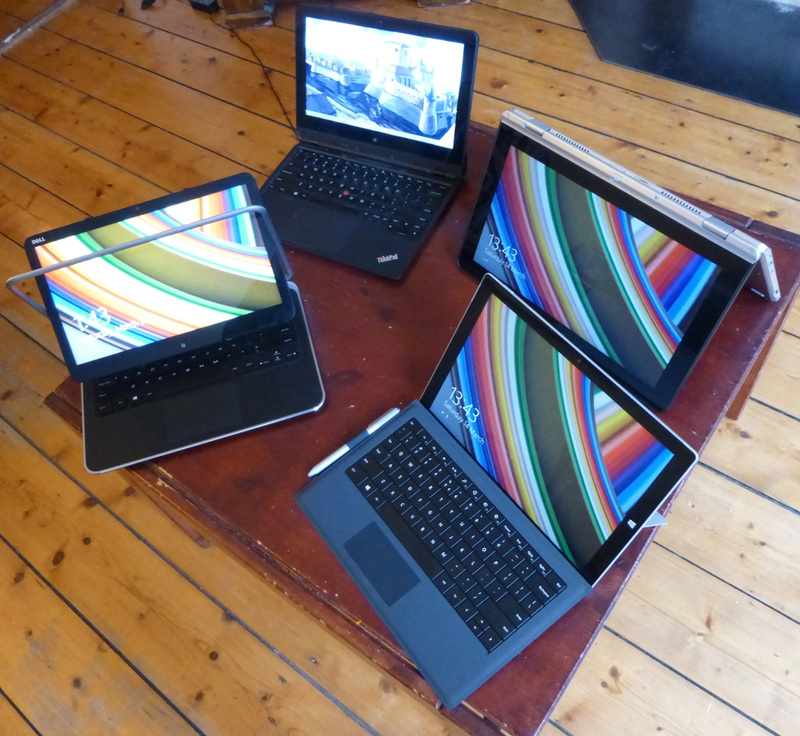 There’s the bend-over-and-over-and-over model pioneered by the Thinkpad Yoga (but this is an Intel SDP, not a Yoga, all the Yoga’s are with other ex-KO colleagues) and finally the screen tumbler of the Dell XPS 12. Every model on the table has its own foibles. The Helix actually doesn’t do the 2:1 automatic switch trick, but that’s because it’s also the oldest model we’ve got around. The Helix basically has only one angle between the screen and keyboard, and that’s it, and it’s fairly upright. The keyboard is pretty good, the trackpoint is great, of course. In contrast to all the other devices, it also runs Linux quite well. The power button is sort recessed and really hard to press: it’s hard to switch the device on. The built-in wacom pen is impossible to calibrate correctly, and it just won’t track correctly at the screen edges. As tablet, it’s nice and light, but the rip’n’flip thing is flawed: doesn’t alway re-attach correctly. I cannot talk about the what’s in the Intel SDP system, because that’s under NDA. It’s got a pen, just like the Surface Pro 3, and it’s nice, light and a good harbinger of things to come. The form factor works fine for me. Some people are bothered by feeling the keys at the back of the device when it’s in tablet mode, but I don’t care. Tent mode nice for watching movies, and presentation mode sort of makes it a nice drawing tablet. The Surface Pro 3 is rather new. I got it as test system for Krita on Windows. It’s the lowest spec model, because that makes the best test, right? I can use the thing on my lap, with the kickstand, but only if I put my feet up on the table and make long legs… The n-trig pen is sort of fine… It’s accurate, there’s no parallax as with the Cintiq or Helix, the pressure levels are fine, too, for my usage that is. But because it’s a bluetooth device, there’s a noticable delay. It’s a bit as if you’re painting with too thick oil paint. I never remove the keyboard cover, which, btw, is perfectly fine to type on. It feels a bit tacky, folded back, but not a big problem. Next Next post: The World is Wrong!! !